Fit Foodie Megha: Persian Food Festival - Westin, Pune — Reviewed! I was pretty excited about the Persian Food Festival to be organized at Westin, Pune. As per my knowledge, this is the first time any hotel has come up with the idea of serving persian food. I had to visit for this and satiate my knowledge bud. I reached on the second day of the festival and trust me the restaurant was flooded with the curious eyes. 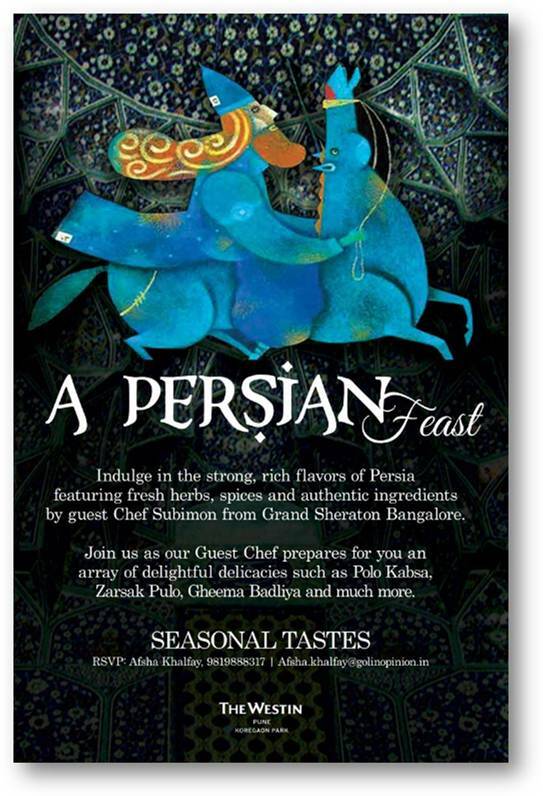 A week long festival has rich flavours of Persia prepared by guest Chef Subimon from Grand Sheraton, Bangalore. Executive Sous Chef Gaurav Anand and Chef Subimon were there to welcome and brief about the wide spread buffet of Persian dishes. Chef Gaurav explained the key elements of cooking the same. Usually the food is colorful and basic. Recipes are not played around much. Fresh herbs are majorly used along with fruits such as plums, pomegranates, apricots, and raisins. Typical Persian main dishes are combinations of rice with meat, such as lamb, chicken and also with vegetables. Balance in taste is acquired by mixing flavourings like saffron, dried lime, cinnamon, and parsley delicately and used in some special dishes. Ash-Adas or Lentil soup was quite filling. Made with green lentils, thick soup was filled with healthy ingredients. We were presented staple - Mezze platter with the pita bread. Out of the above mentioned, Hummus, Babaganoush were really authentic and tasted great. All had a distinctive flavour and texture. Loved all but Muhamara (Red Pepper with walnuts) was my favourite. Falafel were prepared beautifully with that crisp and crunch crust and moist centre. Tasted classic with the traditional soft pita bread and hummus. Amazing combo. Paneer Sabzi Kebab were nicely presented in wooden sticks and looked like a colorful stick. Paneer was succulent and well marinated. Liked it too! Moving on to the main course with less space in tummy, could not control but tried Saffron Rice. Mild sweet flavour with fragrant water was making the bowl full of aroma and taste. Must try! Each and every curry I tasted, was just perfectly balanced with fragrance and flavour. Cherry on the cake was the Baklava, a flaky pastry with sugar syrup and some dry fruits. You need to eat this to believe me. One of the best one I had in town. Omali, more like a pudding, had healthy nuts and had classic taste but Baklava was a clear winner. Block your dates to have persian feast; the festival is going on till 24th July only!